Do you have an anecdote you want to share? A hard thing that's still happening? None of the above but something burning to be in print? My Blended Blog buddies and I are launching a new series and I would LOVE for YOU to be part of the conversation! Each week will have a different topic, if you’re feeling extra wordy, feel free to submit for more than one theme. Feb 19 - 24: Watch Embrace (available to rent on Itunes- Documentary, Gravitas Ventures) and create a post using one or some of the questions in the discussion guide (here)- tell us what you took from this film. Feb 26 - Mar 2: Affirmations and self-talk: share your tips, what do you do to build up your confidance? Life hack survival tips: What do you do well that helps you get through life? See an example of a post here. Mar 5 - 10: I’m *insert your age here* and I tried it : any fun trends you want to share that you’ve tried? Or that you’ve been dying to try and just need that little push ? Have you accomplished something that you are really proud of? Here’s an example of what Abbie tried at 35. Mar 18 - 23: A woman you admire: tell us about the/a strong women/woman in your life. I will include a bio of your awesomeness and your words. I'm sorry to say that I'm not paid so neither will you be but I would love to promote any links you have to your amazingness and send you free hugs. You don't have to be a blogger to participate! 1. Posts that sound like "do it my way 'cause it's the right way." 2. A blatant advertisement for a business (mentions are fine!!). 3. Meanies. You know who you are. 4. More than 7 swears per line. Ow, my ears. To sum up, in the words of of the lovely Malyn, "I was never at the cool mom table but we made our own table and we're all invited." Email or message me on Facebook or Instagram if you've got a great idea or an already formulated post! You do NOT have to a professional blogger/writer/person. You do have to be yourself. Can't wait to hear from YOU! P.S. I may not be able to use all of the submitted posts depending on the amount received but I hope to publish as many as I can and THANK YOU for your time and submissions. 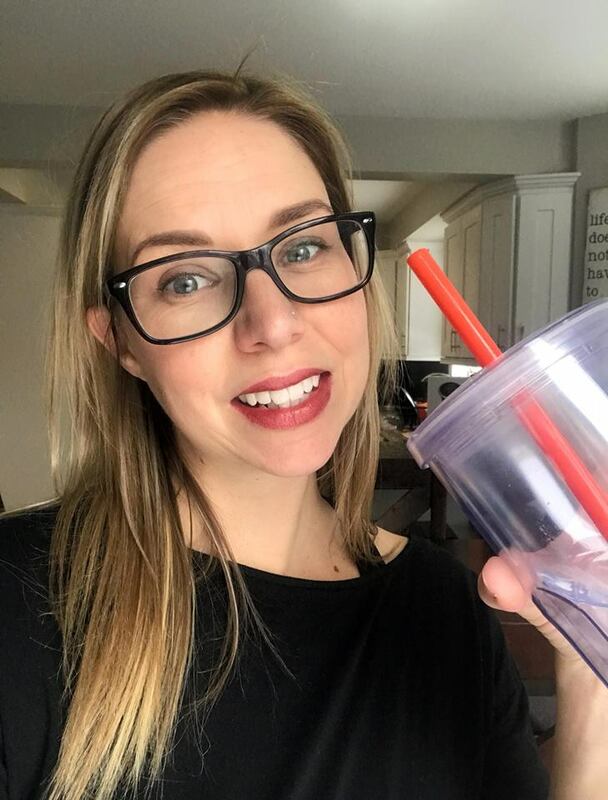 I am on maternity leave until October 2018 (thank you Canadian Government, no, really, THANK YOU. Having so many American friends and family, I am so grateful for this) so my goal for most of 2018 is to GET DRESSED. That simple. Get out of pjs. So far, so good. I make a point to get dressed do something with my hair or makeup most days just because I feel better when I do. In reality, I don't leave the house much (aside from picking biggest up from school) but it's more about how I feel. My outfits often consist of a tunic and leggings but again, I'm okay with that at this stage of the game. In short: keep getting dressed and try and do something hair/makeup-wise BUT I'm also being kinder to myself this year, so if these things don't happen every.single.day. I'm not going to cry about it. How: just do it - hair/makeup as soon as I get up (before the day starts or it doesn't happen). Get dressed before going downstairs (or, surprise, it doesn't happen). I've been good at this, I think I can keep it up. 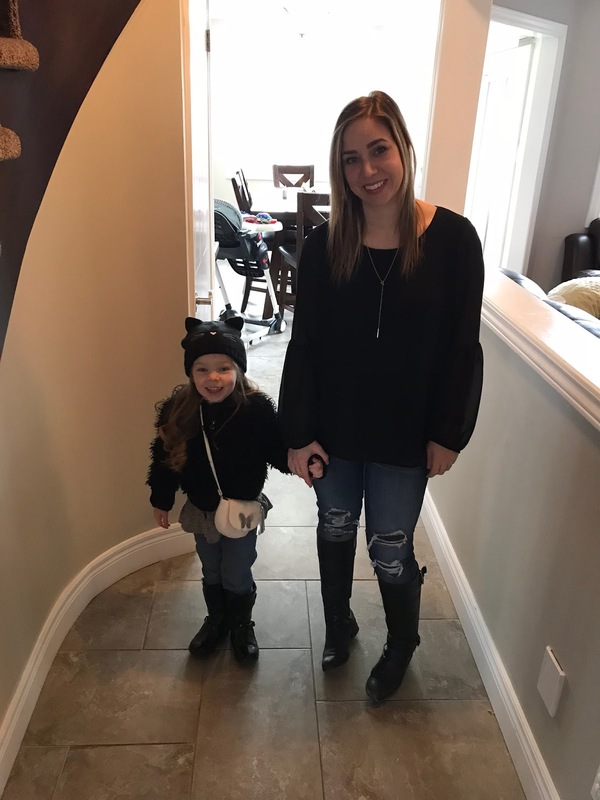 mini me and I heading out for a mommy-daughter date - it's entirely possible she's the more stylish of the two of us. Okay, she definitely is. Well, lucky me, baby #3 means no dairy AGAIN (did that with baby #2 and YES, I'm being sarcastic, I could eat a brick of chedder with a side of brie followed by a package of goat cheese... in case you're wondering). 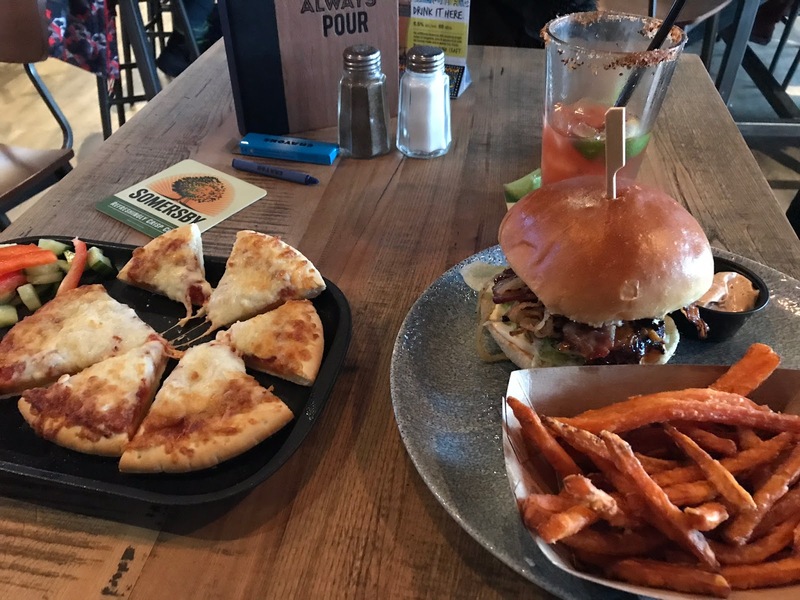 You'd be surprised to know how poorly you can still eat even when you're not able to eat all the dairy (if you take away the cheese, the majority of the McDonald's menu is dairy-free - not that I've researched that... or whatever). I need to do better with what I eat and not because I want to weigh ____ lbs, but because I'm not eating the way I know I should be. How: make a freaking meal plan. Need to do this. Every week. Also, prep all.the.things. I always eat better when healthy food is readily available to me. I should be eating a lot less of this (burger has no-cheese - see what I mean? dairy-free does not equal healthy lol but so so so so good). Pretend you're not drooling, I dare you. MOVE IT! I shared on Instagram recently that I took my FitBit off the day I was induced with Lillian (Oct 10, 2018) and haven't put it on again since (until Jan 24th) and I told myself (and others) that the reason for that was because I didn't want to hurt Lillian while holding her BUT the REAL reason is that I didn't want to know how little I was moving or be accountable for that. The good news? Day 1 of wearing my FitBit and not moving ANY more than normal, I did almost 10,000 steps!!! WHAT?! So not nearly as bad as I though (by like 7,000 lol). Now, to tone up... ugh. this past week (before I came down with the flu - ew) - first non-yoga workout post-baby. I almost died. 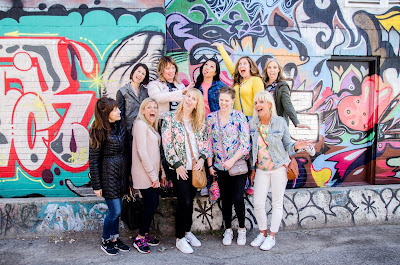 Surprisingly, I actually do have some friendship goals for 2018 one of which includes meeting up with the Blended Blog crew in South Carolina in October!!! LOOK OUT!!! I also want to spend more time with some friends that are very dear to me (you know who you are) and have a couple friends who I adore and need to spend some time reconnecting with (assuming they'll have me lol). If you blog, you know that the holy grail of blogging is the email list. At least, that's what "they" say. So I obligingly created an email list and guess what I did with it? Come on, guess. Well, those of you who "subscribe" to my email list already know, nothing... I do nothing with it. That's probably why people keep subscribing, they know I'm not spamming the crap out of them. SURPRISE, I am actually going to send an email. This is not a drill. 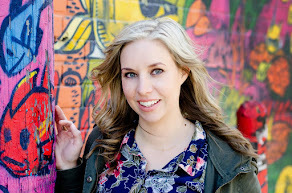 I'm going to send an email soonish (because, well, you know I'm not awesome with timelines and my kids have me super non-committal these days). What's this email about you ask? Well, I may be asking YOU to contribute to my wee space on the internet. No need to have a blog, be a famous writer or any of that, just maybe have something you'd like to share. So, moral of the story/blog post: you want the goods, sign up for my email. The good news is, you will not be spammed with daily emails, because, well, I have no time for that. Also, if I happen to turn into a super-organized, daily-blogging, email-writing/spamming monster (this is highly unlikely) there's always the unsubscribe button (I use it alot, I won't lie). Self-care, that thing we all know we should be doing and could ALL be doing more of. Ya, that. As a social worker, I know A LOT about self-care and it's something that I'm very quick to tell people they need to do more of but guess what? I'm not always the best at taking my own sage advice - whoopsie. I'm a mom of three (still so weird when I say or write that lol) and I'm busy, VERY busy. There is literally always something that needs to be done or a little person that needs my attention. So there my attention goes - to doing all the things and taking care of all the people. The problem with that is that I'm the first one left behind. I get so busy making sure everyone else is taken care of, that my own care gets put on the back-burner. 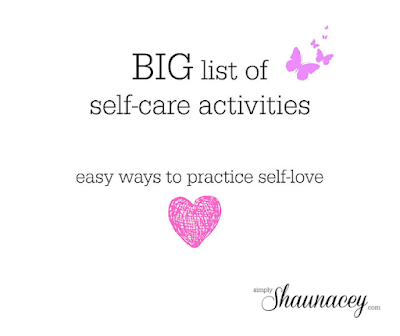 What happens when my own self-care is constantly last priority? I get GRUMPY!!! Not only am I grumpy but I also have less patience and am not fun to be around which results in the people I'm so busy taking care of being less happy. It's a vicious cycle one that can be stopped in its tracks when I just TAKE CARE OF MYSELF TOO!!! Okay, not so easy but it NEEDS to be made a priority. YOU, ME, WE need to make ourselves a priority and what I'm learning is that it doesn't mean a trip to the Bahamas (though, sign me up for that please - I'll need a sitter, you in?) and it doesn't need to take up a lot of time or money (but if you're throwing either of those around, over here please) it just needs to happen. Not only does it need to happen, it needs to happen every.single.day. Sometimes for me it means a hot bath with a glass of wine (and the door locked because: kids). Sometimes it means a hot yoga class. Sometimes it's as easy as a few extra trips around the block once I've picked my oldest up from school while I sip my coffee/tea in silence (well, kinda silence, Paw Patrol is obviously playing on the DVD player otherwise I'd be listening to the kids - I'll take it). So friends, my challenge to you is every single day this week get very intentional about the ways you're taking care of yourself. I don't mean looking back saying "well, I read my book for 5 min, that counts" I mean BEFORE the activity saying "I am doing this for me" or "this is my self-care activity". Bonus if you do more than one!! To help (because I'm nice like that) I'm sharing my most popular post with my Big list of self-care activities - there's something on this list for EVERYone not matter how much time, money or energy you have. What does this year hold for you? Some people say resolutions are cliche and act like they're too cool for school when it comes to setting goals for the coming year. Here's the thing though, it doesn't matter when you're setting goals and intentions, just that you are. I am guilty of setting goals or intentions and then letting them fall by the wayside. January is always a lofty goal month for me. Last year I even wrote down a plan for the year. WHAT?! Ya, my gf and I did a planning day to set our goals for 2018... then I got pregnant (which wasn't exactly in the 2017 plan) and I got so thrown off track. Turns out it was the best "accomplishment" of 2017 and completed our not-so-little family but I totally let this surprise derail me. I let a lot of my goals get lost and I think I need to pick them back up BUT I need to also show myself a little grace because, I have learned, that doing and being all of the things and trying to do so perfectly, results in this momma being super stressed and unhealthy and that's kind of the opposite of what I'm going for here. Blog - figure it out. Update: didn't figure it out. Still figuring it out. I think this needs to be kept as a goal but with less focus on "figuring it all out". I want to keep blogging but recognize I may not get to an "end place" of what I want this blog to look like and I'm cool with that. Update: negative. We'll keep this one too. Exercise 4 times a week. Update: I am happy to report I feel like I killed this one!! I worked out 4-6 times a week until I was about 34 weeks pregnant. This resulted in a pretty healthy pregnancy and in this momma getting back to her pre-baby weight in record time. Sadly, I haven't exactly hopped back on the workout train. Okay, I'm nowhere near the station. 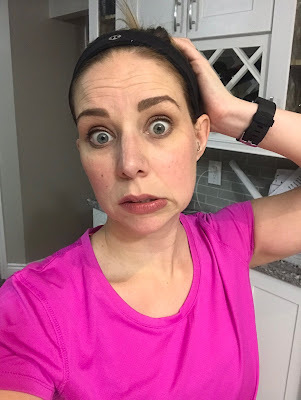 I need to have exercise as a goal but I'm not giving myself a number because the real number is 3, the number of kids I now have which results in the inability to schedule virtually anything, including exercise. Goal: exercise. Get a massage once a month. Update: didn't happen. I went a few times but definitely not once a month. I like massages and would like to get more (thank goodness for good benefits) but picking a number is unrealistic for me and I feel like I'm setting myself up for failure. I hope to have more massages this year but I'm not making it a goal. Meeting up with my blog friends. Update: it happened and it was AWESOME. We'll be meeting up AGAIN this year!!! WOOT!! So Blog meet up added for 2018 - yay! 2017 meet up in Toronto! Niagara trip with Mr B.
Update: didn't happen. I would LOVE to add this to 2018 but if I'm being realistic, we now have 3 kids under 5 and who the heck is going to volunteer for that kind of craziness?! lol Maybe 2019? Update: didn't happen. I did meditate a bit in early 2017 but not once a week. I'm keeping this for 2018 and I think I need to put a reminder in my phone so that I make sure I do it. Night out once a month. Update: HA!!!! I didn't exactly knock it out of the park with this one, but I did get out more than I normally would have an with baby #3 I've already had a few kid-free dinners with friends, shopping trips etc. I'm changing this goal to read: more me-time. Me-time for me can mean some self-indulgence (mani, pedi anyone?!) but also time with my girls to recharge or even an intentional hot bath (with the bathroom door locked, obviously). Update: HARD FAIL. I think we maybe went on 3 or 4 dates in 2017. We MUST get better at this. The tricky thing is, it's next to impossible to find time right now. For 2018 I think we need to work on ways to stay connected while parenting 3 small children. We may not get out of the house together once a month but will to be more deliberate about the time we have together, even if it's just after the kids are in bed (ya know, assuming all three kids sleep at the same time lol). One-on-one time with each child once a month. Update: I think I did pretty good at this one. I don't and haven't kept track, but I know I have spent intentional time with each kiddo on their own. This is something Mr. B and I just do, so I don't think I need to keep it as a goal for 2018 because it's kind of just how we roll around here. Update: Definitely improvements in this area. Woohoo! It helped I was wearing maternity clothes most of the year and couldn't buy clothing lol. I'm going to keep this up in 2018. Less credit card use/reduce debt. Update: KILLED IT! I paid off ALL my credit card debt AND my student loans this year. I have managed to keep my credit cards paid off when I do need to use them (online purchases etc). I am super proud of myself for this one. 2018 - keep it up! Update: This is the area I think I am hardest on myself. Now with three kids I am finding I need to be much kinder, not to my kids, but on myself. So in 2018 kinder parenting has a two-fold meaning for me, parent with love (even though I'm strict with my kiddos) and be kinder on myself. Be a better leader - in 2017 I signed up to be a LipSense Distributor (you can visit me on Facebook if you're interested in more info). Mostly for a discount but it kinda morphed into more really quick. I'm loving this product and venture and it's been a really fun side-gig for me. Who doesn't want to play with makeup and hang with some amazing ladies. Surprisingly, I quickly grew a little team and would love to be a good leader to them in 2018. Dream BIG! I've mentioned the negative self-talk earlier in this post and because of this negative self-talk, I've often told myself that I couldn't do the things that I want. That and I let outside sources (i.e. what people might think) dictate my actions and plans. Not cool. So my HUGE goal for 2018 is to really sit down and figure out who I am and what I want out of life and believe that I DESERVE it all. Because, why the heck not?!?!?!?!? What are your goals, intentions, resolutions etc for 2018? What would you like to see unfold? Link up your goal related posts with us (the Blended Blog) below! Anyone else seen these posts and felt incredibly daunted by the task of picking one single word for the entire year? Just me? I have always loved the idea behind "a word" but never had the decisiveness or insight to be able to narrow it down to one, all-encompassing word. In previous years, I've copped out and picked a whole wack of words because there was no way I could bunker down and pick the perfect one for me. Leading up to 2018 I had started percolating a little on picking a word; however, stopped myself short because there was no way I was going to be able to decide. Before committing to picking a word, I decided it wasn't for me but it kept bouncing around in my head and my Facebook feed. I continued to see people having epiphany after epiphany about their words and then was left thinking "how does that even happen?" Never calming my life or mind enough so that anything would miraculously come to me. Ya, you read that right, it's embrace. The second I thought this word I knew it was perfect, I knew it captured all areas of my life where I want to learn and grow and thrive... Embrace. Why? Because it concisely captures all of the things and for every new goal or intention I've thought of since, "embrace" just fits. What do I want to do in 2018? the chaos of my home life with 3 young kiddos - it's loud and wild and draining but it can be awesome. I need to just let it be what it is and instead of worrying about cleaning the house just sit on the floor with the kids and read a story or have a dance party in the kitchen. They give zero sh!ts if the house is spotless so as long as we're not tripping over garbage, fun comes first! the opportunities - I have no idea what opportunities may present themselves in 2018, maybe none, but should they, I will try and make myself open to the possibilities, whatever they may look like. silence and stillness - I need to find (or create) moments of silence and stillness and let them be instead of rushing and feeling the need to be doing all of the things (i.e. in yoga class - instead of making my to-do lists, enjoy the peace and quiet). my friends and family - honing in on the relationships that bring me happiness and creating more moments with those people. change - this is a tough one, change is hard, but it can also be awesome (example: baby #3 lol). There will be changes in 2018 because change is inevitable, similar to opportunities, I know not yet what these might be, but I hope to embrace them as they present themselves to me. my true self - this is a BIG one for me. I'll explain in more in future posts but my #1 goal this coming year is to really hone in on who I am as a person and let go of trying to do and be things for the sake of others. We get one shot at this life and living it for other people does not bring joy. I've not written things here because of worry what others will say or think. That's ridiculous. From now on I ask myself: "does this bring you joy?" if the answer is yes, it's happening! End.Story. So there you have it friends... my word for 2018. Do you have a word or words for this year? I'd love to know what yours is. Hair colour - not that I change my hair that drastically ever, but a fresh colour always makes me feel great! This year I REALLY want to do more hot yoga. I bought a 20 class pass last winter but couldn't go because shortly after I bought it I got pregnant. I'm hoping to use up that pass and then some. Cold. January can be so so so so cold here. I don't like being cold. The new year just feels like a fresh start. A reset. A time to make all the changes. Follow through is a whole other thing but the newness of everything feels exciting to me. Mine are down already! I like to put up decorations early and take them down early. Tree and decorations came down here Dec 30 - no decorations past New Years here! I have dieted in January or resolved to eat healthy or whatever. This year I'm not specifically "dieting" but I would like to try and be more mindful about the things I'm eating. Oh there are so many options here. I'll have to go with my closet. As I write this I debate showing you a picture... it's bad guys, real bad. I have piles of clothes I don't wear, some maternity wear I need to do something with and then a whole lot of other stuff I need to go through. It's highly unlikely that this organization will happen in January but it really needs to happen at some point lol. Chili and soups. I love me a bowl of chili with a salad and garlic bread or some homemade soup with fresh bread. Okay guys, now I'm hungry... good thing I'm almost done writing this - momma needs to eat! Red wine and dark chocolate. There's nothing I find more wonderful than cozying up on the couch with my hubby, fire place on, movie playing, glass of wine in hand and bowl of chocolate covered almonds. Yup, still hungry. 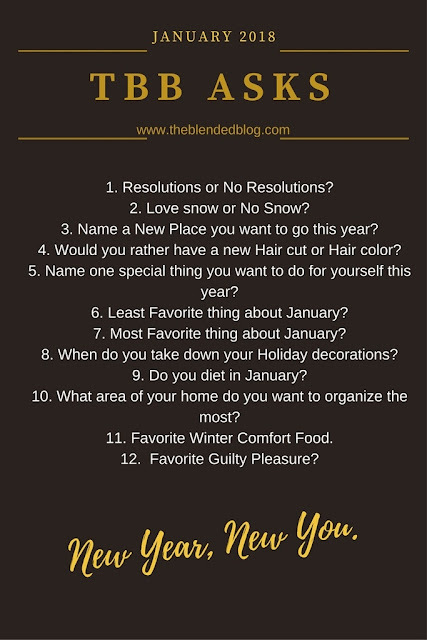 Feel free to grab the graphic at the top of the post, linkup your post below and head on over to the Blended Blog to see what else we've got going on! Baby, it is REALLY cold outside!! If you're like me, your skin is NOT a fan. And by "not a fan" I mean has turned into an uber-dry alligator-resembling layer on your body. I'm sure living in the cold great white north is part of my problem but besides the chilly weather Nov-Mar, I kinda love it here so will have to deal. Wash with warm water. This is a hard one for me. When it's super chilly there's nothing I love more than a hot shower or bath. By hot I mean HOT! Unfortunately, this is the absolute worst thing for your skin, especially during winter. I'm trying to turn the temp down a few notches in the best interest of my skin, you should too! Moisturize ASAP. Somewhere along the lines it was ingrained in my head that if you moisturize immediately following a bath, shower or washing your face, your skin is more likely to lock it in. Who knows if this is actually true (like scientifically and stuff) but my skin does feel more supple if I moisturize while still damp. Have both your body AND face moisturizer on the bathroom counter so there's no forgetting! Better yet, have it in the shower with you so it's the first thing you do once you turn that water off. H20. I swear, drinking more water is the cure to all of the things. Seriously, when in doubt, up your water intake. This is something we almost all do less of during the cold winter months but that's the time when our bodies, particularly our skin, needs it the most. Carry water with you wherever you go. If you really find drinking enough water a challenge, set yourself reminders on your phone! Exfoliate. Slough off that dead skin so all that moisturizer can get where it needs to go. Loofahs, scrubs, exfoliating gloves can all help get rid of the dead skin on your body. Use on your face, lips and all over your body and then moisturize right away. The key here is to be gentle - scrubbing too hard will be counterproductive and could irritate your skin. Use a good face mask. There are tons of homemade recipes out there that you can literally whip up with ingredients from your own kitchen. Or maybe you have favourite moisturizing mask that is your go-to (if you do, share it in the comments to help us all out! Right now I'm loving the Detoxifying and Moisturizing Mask from SeneGence). Protect. Just because the sun isn't beaming down, doesn't mean you can skimp on your sun-protection. Make sure that you're using a face cream with some built-in sunscreen. Cool it on the alcohol and caffeine. Ya, I know, I love all the coffee and the wine too but it's not exactly skin-friendly. There's no way I can skip the coffee in the morning but I'm okay adding a hot water with lemon for another hot beverage later in the day. Use gentle products. Now is NOT the time to try that super fragrant hand-cream or body butter. Skip the irritating products and opt for something you know will be gentle on your thirsty epidermis (had to throw that word in somewhere). Hope that was helpful - if you have some tips or tricks you use to keep your skin supple during the cold weather months, I'd love for you to share them! I hope you all had a fun farewell to 2017 and I just have a feeling that 2018 is going to be a good one, why? Because we shall make it so! Cheers to a new year, new opportunities, new challenges and lots of love and happiness.